Moscow City Hall has allocated $190 per month for every stray dog that is housed in its animal shelters this year — the same amount that Prime Minister Vladimir Putin has deemed as Russia's minimum living wage in 2010. “In good facilities, a dog can live up to 15 years," Luzhkov said on city-controlled TV Center television last month. "We cannot take care of dogs for such a long period of time. No city budget could survive such a heavy burden." Moscow's existing 11 animal shelters can house up to 11,000 stray dogs and cats, and four additional facilities are to be built soon to care for a total of 18,000 animals, city officials said. Luzhkov, in his televised remarks, said city authorities would spend more than $25 million to feed the dogs in shelters this year — a sum that puts the monthly expenses per dog on par with the country's 2010 minimum living wage of 5,790 rubles ($190). When the new shelters are built this year, the authorities will spend a total of $33 million a year feeding dogs, Luzhkov said. The numbers mentioned by Luzhkov represent a sharp drop from the $99 million that the city earmarked for taking care of stray animals last year. That figure was mentioned in a letter sent by Luzhkov's deputy Pyotr Biryukov to Sergei Mitrokhin, who at the time was a City Duma deputy with the opposition Yabloko party. Mitrokhin, who lost his seat in October elections widely denounced as rigged, said he had written to Biryukov as he sought to track the "huge" funds that City Hall was spending on strays. "Nobody has provided an answer,” Mitrokhin told The Moscow Times. Part of the answer might be found in a 2008 tender that City Hall held for a new dog shelter in the settlement of Severny, north of Moscow. The tender was won by UniversStroiLyux, a construction company that has bid in several tenders to build shelters in recent years and, according to the SPARK-Interfax database of companies, is owned by Alexei Biryukov, a brother of Deputy Mayor Pyotr Biryukov. , according to documents from the Moscow tender committee obtained by The Moscow Times. But 18 months later, no animal shelter has been built in Severny — even though City Hall has paid 35 million rubles ($1.2 million) to a company called Profit Project to create blueprints for the shelter, according to tender documents. Severny authorities said protests from local residents had helped block the shelter's construction. Residents balked at the plan to build a shelter for 6,000 dogs on a five-hectare plot just 500 meters away from residential buildings, said Alexander Orlov, a Severny official. “Can you imagine 6,000 dogs barking into the night?” he said. The new plan is to build a facility for 2,000 dogs, and new blueprints need to be drawn up, he said. UniversStroiLyux, for its part, accepted the money allocated for the Severny shelter and later returned part of it, said Natalya Sokolova, an official with City Hall’s communal department, which deals with the construction of dog shelters. She declined to say how much money had been returned, saying the matter was under audit. An UniversStroiLyux official, Yury Sichev, declined to comment on the Severny shelter other than to say his company was no longer involved in it. He said dog shelters were a minor part of the company's work. “For us it is just a side business,” he said. Even as a side business, UniversStroiLyux has run into a series of problems over its use of city funds to build the dog shelters, said Tatyana Pavlova, former head of the City Hall’s department for flora and fauna who left the position for a private veterinarian practice in 2006. She said $2 million was returned to the city from various dog shelter projects after the city's financial control office conducted an investigation into the tenders for the shelters. She cited a letter she received from the city's financial control office in January. No one has been punished in the case, she said. UniversStroiLyux has built three dog shelters, Sichev said, including one in Moscow's Southern Administrative District where Pyotr Biryukov served as prefect before being appointed deputy mayor in charge of the city's communal sector in 2007. Russian law does not prohibit relatives of government officials from taking part in tenders organized by government agencies. Repeated attempts to arrange an interview with Pyotr Biryukov were unsuccessful this week. A spokesman for his brother, Alexei Biryukov, said Thursday that the businessman was on vacation and unavailable for comment. Apart from dog shelters, UniversStroiLyux's projects have included the construction of a replica of the wooden palace of 17th-century Tsar Alexei Mikhailovich in Kolomenskoye, also in the Southern Administrative District. The palace’s price tag was $26 million when it started in 2005, but the city department in charge of construction informed Luzhkov that it needed an extra $6 million to complete the project. In June 2009, Luzhkov refused to sign off on the additional funds, Rossiiskaya Gazeta reported at the time. Critics of City Hall say another possible answer to the puzzle of how city funds have been spent on strays can be found in counting the number of strays, which has remained stable at about 30,000 dogs for the past decade. Moscow authorities say the number has not changed — despite costly efforts to neuter dogs and keep them in shelters — because new strays wander into the city from the surrounding Moscow region and the remaining non-neutered female dogs are extremely fertile. But critics like Pavlova, the former city official who now runs a veterinary clinic, said the city's efforts to sterilize dogs have been haphazard at best. Pavlova established a neutering program for City Hall that opened with Luzhkov's blessing in 2001 but was subsequently shut down by Pyotr Biryukov. The program envisioned releasing neutered dogs back into the streets. “It was probably not an ideal solution, but we were not looking for one. We were trying to save the dogs by the existing means,” Pavlova said. She said the program had some pluses, including the fact that the neutered stray dogs defended their territories from aggressive newcomers. Although supported by animal lovers and rights activists, Pavlova's program faced criticism from some top city officials, inсluding Moscow's chief sanitary doctor, Nikolai Filatov, who in 2004 warned Luzhkov that returning neutered dogs to the streets could pose a danger to people if the dogs contracted and spread rabies. Sokolova, from the city government, said her department was still neutering dogs but most existing shelters were filled. She said that under the program, the city has to neuter all caught dogs, even sick ones. 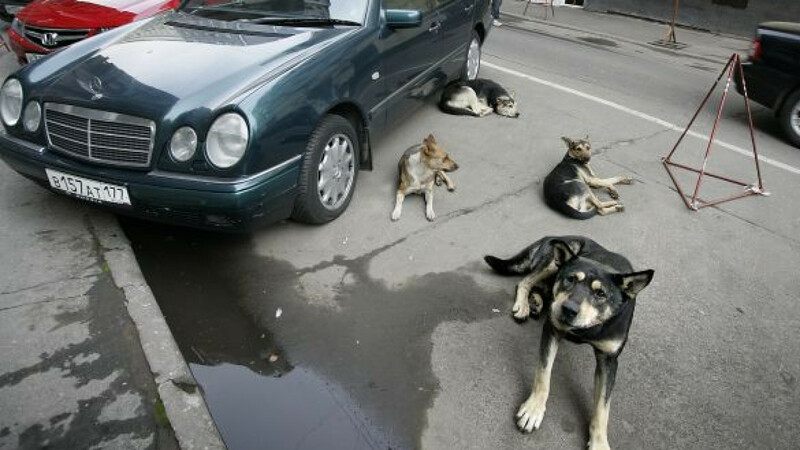 As Luzhkov suggested last month, city authorities seem to have found a cheaper solution to control the stray dog population — putting them to sleep. Under a decree signed by Biryukov in June, a copy of which was obtained by The Moscow Times, officials running dog shelters will receive the right to put down animals deemed sick or “unruly and aggressive.” The decision would be made by a commission of shelter staff, headed by the shelter's chief veterinarian. Pavlova plans to challenge Biryukov's decree in court and is currently preparing papers to file the lawsuit. She said renowned rock singer Andrei Makarevich and several other prominent pet lovers would join her as plaintiffs in the case. Under current municipal law, stray dogs can be kept in shelters at the city's expense for up to six months and, if not collected by their owners or adopted by new families, they then become the property of the city. The law does not allow for them to be put to sleep. Animal rights activists are furious about Biryukov's decree. “This is an illegal decision, and this document smells like the slaughter of animals,” said Konstantin Sabinin, an activist with Vita, an animal rights group. "They have too many animals in the shelters, so they need to get rid of them to make room for new ones." He said that instead of fighting financing woes by putting dogs to death, City Hall should be trying to control private dog breeders who work without licenses and be demanding that the owners of house pets neuter them to help control the population. “They are just working from the wrong end,” he said. While Muscovites are avid pet lovers, few visit shelters to adopt dogs, said Sergei Kruchina, a professor at the Timiryazev Agricultural Academy who runs a small private shelter for stray dogs. “We don't have a culture for adopting dogs from shelters,” he said. In 2009, Muscovites adopted only 400 cats and dogs from shelters, Luzhkov said. Kruchina built his shelter, which houses 35 animals, with the help of donations from businessmen and international grants. He spends $150 per month on every dog — savings from the $190 earmarked by City Hall. Kruchina said the money comes from private donations and operations to neuter dogs performed at the shelter's clinic. Some of his dogs have lived at the shelter for several years. “They are too aggressive, and no one wants to take them home," Kruchina said. "But if you set them free, they might be killed."